Who doesn’t love pasta? Not anyone in this house! We love pasta, and we already think pasta is healthy anyway, but these wholesome Barilla Whole Grain Pasta is taking us up to a higher lovin’ level! Barilla just created the Whole Grain Taste & Share Challenge to encourage and even healthier way of eating and to promote this new line of pastas. As part of the challenge, anyone can receive a $1 off coupon for themselves and another to give away to a friend, just by submitting a code from a purchased Barilla Whole Grain box at www.facebook.com/barillaus. Barilla Whole Grain Pasta has three times the fiber of regular pasta, making any meal more nutritious. Paired with fresh vegetables, and you’ve got one tasty and healthy meal! We got a chance to try these whole grain pasta when we received this awesome box of goodies from Barilla via Mom Central Consulting. 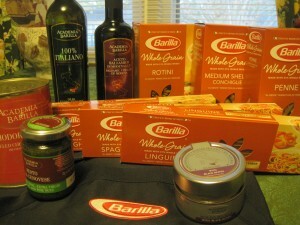 Here is what was in the box: six boxes of Barilla Whole Grain pasta, Academia Barilla olive oil, balsamic vinegar, pesto, Sicilian cherry tomatoes, sea salt with black olives, and a Barilla apron. When we got the package of pasta, my daughter immediately wanted some pasta for dinner that same night. 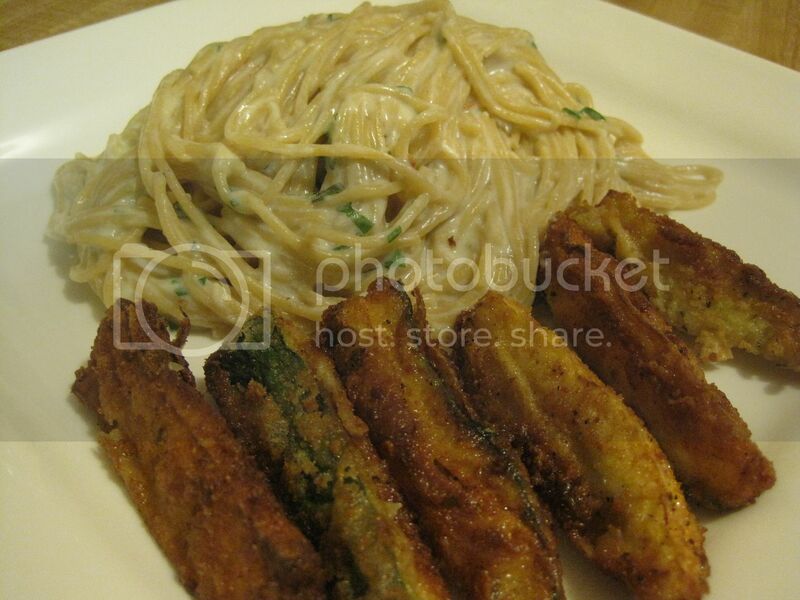 Since it was a weeknight and I really didn’t have a whole lot of time to cook, we came up with this simple combination of spaghetti carbonara and fried zucchini & summer squash. It was a simple meal but it was oh so satisfying! And the best thing about it was, my daughter loved the whole wheat pasta! I loved the idea of her eating whole wheat anything. We are privileged to offer 3 of our readers a chance to win this amazing prize pack in this giveaway. See details below. Barilla has made it an even easier for you to take the Whole Grain Taste & Share Challenge! For a limited time, visit: http://on.fb.me/TryWholeGrain, enter box code 1129 and select two of your Facebook friends to share Whole Grain with. You’ll be instantly eligible to print a $1/2 coupon and your friends will each receive a $1/1 coupon good for any variety of Barilla Whole Grain pasta. Disclosure: I wrote this review while participating in a blog tour by Mom Central Consulting on behalf of Barilla and received a Taste & Share Challenge Kit to facilitate my review, kits to giveaway, and a promotional item to thank me for taking the time to participate.